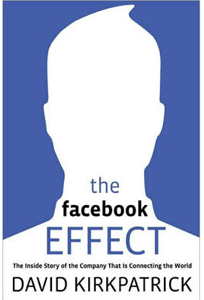 Next week, the Commonwealth Club will be holding a special event that will include our own Michael Arrington interviewing David Kirkpatrick, author of The Facebook Effect, with an introduction by Salesforce founder and CEO Marc Benioff. And it’s a double feature: following the Arrington/Kirkpatrick interview, there will be a second conversation asking if ‘Google is Making Us Stupid’, featuring Peter Norvig, Google’s Director of Research, and author Nicholas Carr, with an introduction from Josh McHugh. Want to go? We’ve got four free tickets to give away. If you want a shot at one, click the handy ‘Like’ buttons below to become fans of TechCrunch and The Facebook Effect, then leave us a comment below saying why you want to go. Feel free to suggest questions for Michael to ask David (though obviously he’ll ultimately ask what he wants). The event will take place in San Francisco on June 23, with check-in starting at 5:15 PM. For full details (or if you want to buy tickets), check out this page. We’ll pick the winners tomorrow at 5 PM — make sure to use a valid Email address (or Facebook Connect) for your comment so we can contact you should you win.